Worship is the divinely created response to the glory of God. It is motivated by divine love and springs from God’s revelation of himself in communion with his creation. Through the church’s worship, believers commune with God the Father through Jesus Christ by the Holy Spirit. Worship involves humbly and joyfully giving God priority in all things and is expressed in such actions and attitudes as prayer, praise, celebration, generosity, acts of mercy, and repentance. The worship of God in ancient Israel was organized around seven festivals based on the agricultural year. Linked together in an annual cycle, these festivals looked back on God’s great acts on behalf of Israel—delivering her from Egypt and forming her into the people of God from whom the Savior of the world would come. By God’s design, Israel’s festivals also looked forward, foreshadowing the coming of Jesus into the world (Col. 2:16-17). In that way, these festivals served as a “schoolmaster” to point the people of Israel to Jesus, the promised Messiah (Gal. 3:24, KJV). With the Messiah’s coming, the schoolmaster’s role ended (Gal. 3:25, KJV) and, for the New Testament church, Israel’s form of worship was replaced by one focused directly on Jesus—on who he is and what he has done for the salvation of all the world, in fulfillment of the Old Testament promises (Acts 13:32-39). Early on, Christian worship focused on the resurrection of the crucified Lord Jesus Christ, celebrated weekly on Sunday (the day Jesus rose from the dead and was first encountered by his disciples) and annually on Easter. 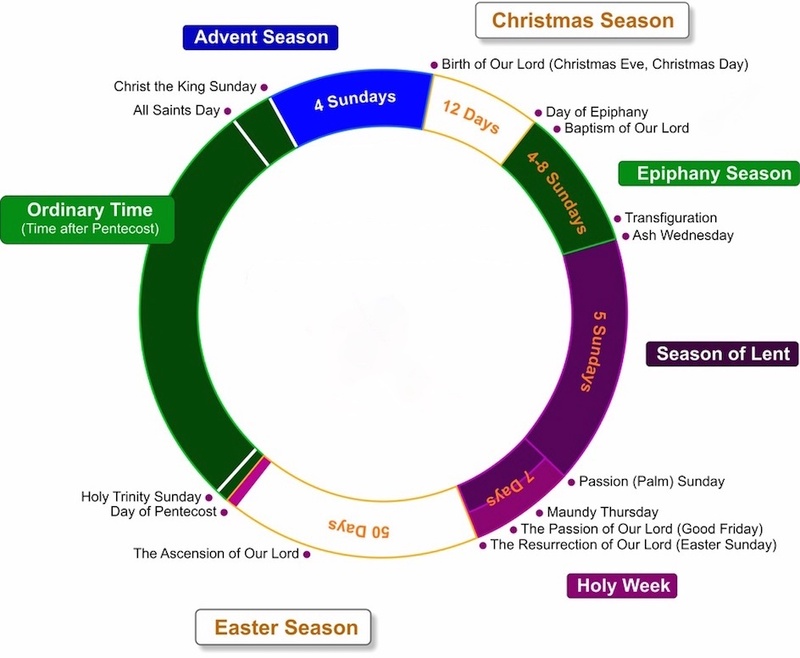 Over the centuries, the liturgical year was filled out with Christ-centered celebrations and commemorations, resulting in the annual worship calendar shown below (click to enlarge)—one that is used by many churches in our day. The annual worship calendar begins in late November (or early December) with Advent Season. The first half of the worship year focuses on key events in the life and ministry of Jesus and the second half, called Ordinary Time (or the Time after Pentecost) focuses on living out what was learned during the first half. Throughout the year, the church’s worship is expressed in words and actions themed to the particular season: songs and hymns, spoken prayers, proclamation of the Word of God in Scripture reading and preaching, and partaking of the Lord’s Supper (also called Communion and the Eucharist). To assist its congregations in following the Christian worship calendar, GCI provides sermons for each Sunday and some of the additional special worship days. These sermons are synced with the Scripture readings set out in the Revised Common Lectionary. To view the sermons published to date in GCI Equipper, click here. Here is a list of the primary worship days and seasons in the Western Christian worship calendar. Some churches celebrate all of these, others only some. GCI asks its congregations to celebrate (as a minimum) the days/seasons of Advent, Christmas, Holy Week and Easter. For additional information and resources related to this worship cycle, click here.